Total area: 8,010 Sq. K.M. 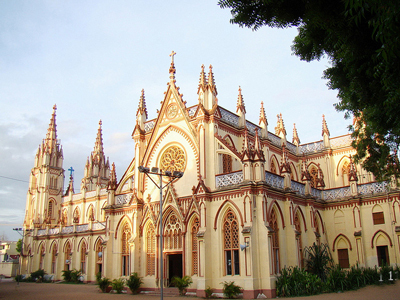 The presentArchdiocese of Madurai in its inception was nurtured by the French JesuitMissionaries of Madura Mission of thethen Malabar Province. Robert De Nobili ( 1577-1656), St. John De Britto(1647-1693), Constantine Beschi, known as Veeramamunivar (1680-1747), James DeRossi (1700) are the valiant missionaries who with zeal created and developedthe Old Madura mission. Missionariessuch as Rev. J.B. Trincal, Rev. Clement Montaud, Rev. Leveille, Rev. Causanneland Rev. Sr. Rose SJL are the ones who worked in the new Madura mission whichbecame the present Archdiocese. St. John De Britto, who was martyred for thefaith on 4th Feb. 1693 at Oriyur, is the Patron Saint of theArchdiocese. The present territory of the Archdiocese of Madurai comprises of the whole of Madurai civil district, Theni District and Virudunagar district and Taluks of Batlagundu, Kodaikanal and Nilakkottai of Dindigul district. The Diocese of Madurai, bifurcated from the Diocese of Trichinopally (Trichy) was created on 8th January 1938 by the bull “Si inter infidels” It included six out of the eight Taluks of former Madurai District, the whole of former Ramanathapuram District and five Taluks of former Trinelveli District. By the Apostolic Constitution “Mutant Res” dated September 19, 1953 the Diocese of Madurai was raised to an Archdiocese with Trichirapalli, Tuticorin and Kottar as suffragans to Madurai. In 1963, the Diocese of Kottar, having been detached from the Metropolitan of Verapoly was attached as a Suffragan to the Archdiocese of Madurai. On September 9, 1973, the Taluks of Ambasamudram, Kovilpatti, Sankarankoil, Tenkasi and Trinelveli were separated from the Archdiocese of Madurai and the diocese of Palayamkottai was created as a Suffragan to Madurai. On August 30, 1987, the Archdiocese of Madurai gave birth to one more Suffragan Diocese, i.e., the Diocese of Sivaganga. On November 10, 2003 a part ofArchdiocese was given to the newly born Dindigul diocese. On 24th February 2015, the newly erected Diocese Kuzhithurai became the suffragan of Madurai Province. At present the Suffragan Dioceses of Madurai are the following: Trichirappalli, Turicorin, Kottar, Palayamkottai, Sivagangai, Dindigul and Kuzhithurai. 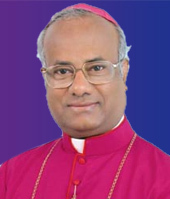 The Syro Malabar diocese of Thukkalay and Diocese of Marthandam of Syro Malankara Church have jurisdiction in the Archdiocese as well.